No sooner do I decry the lack of an iPhone 4 (s aapl) solution from Joby than lo and behold, it arrives. The new Gorillamobile for iPhone 4 brings compatibility to Apple’s latest smartphone and does so with a new design intent on keeping things simple. The Gorillamobile for iPhone 4 is a little late to market, since the iPhone 4 was originally released in June 2010. And Apple’s latest phone is just screaming for a proper tripod accessory, with its new HD video recording features and 5 megapixel camera with built-in HDR. So does the Gorillamobile deliver? Let’s get the tripod out of the way first. If you haven’t used a Joby Gorilla product, you should. They’re very handy both as desktop tripods (for cameras or utility lights) and as flexible grips you can use to attach those same devices to poles, railings and more. 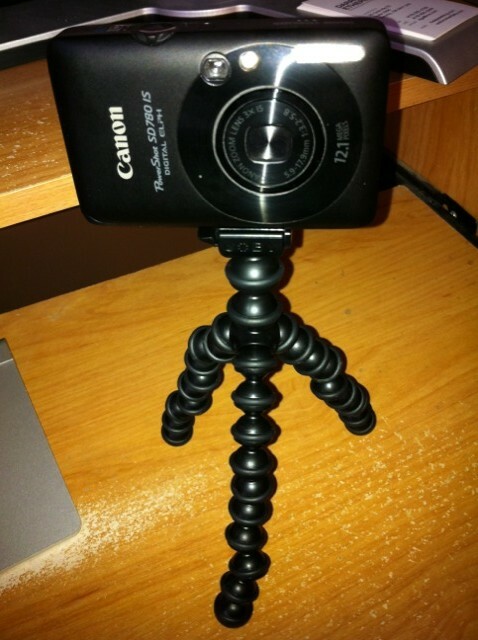 The Gorillamobile for iPhone 4 tripod is no different, though it’s quite small. The size makes it very portable, and if you need more height, you can just wrap the Gorillamobile’s legs around a proper tripod. 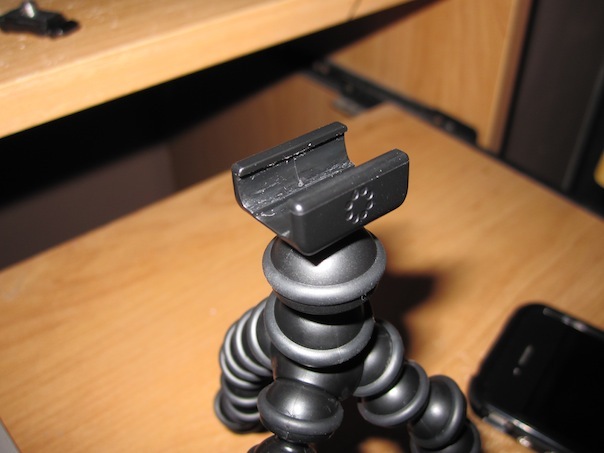 The head of the Gorillamobile for iPhone 4 is specific to the bumper case the tripod is bundled with, so don’t expect to be able to just grab a case and use that with your existing product Gorillamobile. It’s kind of unfortunate that users are forced to upgrade the whole kit (tripod and case) with this version, but at $39.95 (only $10 more than the original Gorillamobile), it isn’t terribly expensive, and the new product comes with an adapter so that you can still use the stand with your digital camera, too. The new design clips on to a special bumper case that comes with the Gorillamobile. Once the bumper is on your iPhone, just slide your device into the head on the Gorillamobile tripod via one corner where the raised bezel is cut out. 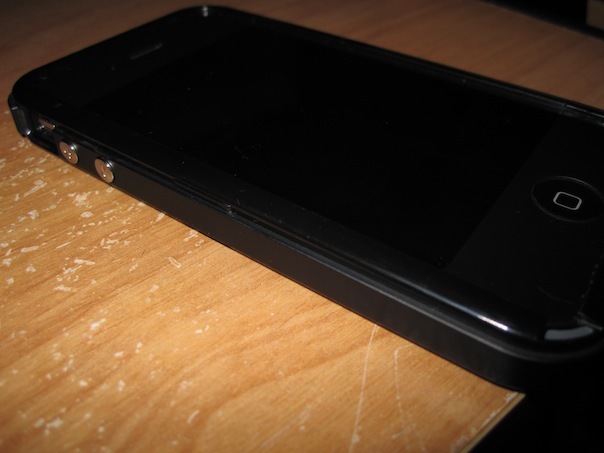 The phone will slide until it hits a slightly thicker part of the bumper, which locks it into place. The additional screw mount adapter fits the tripod head in much the same way. The Gorillamobile worked great for taking FaceTime calls while working at my desk, and for recording video for blog posts. For still photos, you still get a bit of shake when you hit the shutter button, so my advice is to use the Gorillamobile in tandem with a photography app that provides a delay timer. Camera One ($0.99) is a pretty good solution that boasts a lot of features and won’t break the bank. Joby provides its own free app, but it’s badly in need of an update, since neither flash nor “tap to focus” works on the iPhone 4. Highs: Great build quality; low price considering bumper case and tripod included; good for FaceTime. Lows: Not compatible with previous Joby Gorillamobile mounts; slight unsteadiness makes it less than ideal for still photography with built-in camera app. 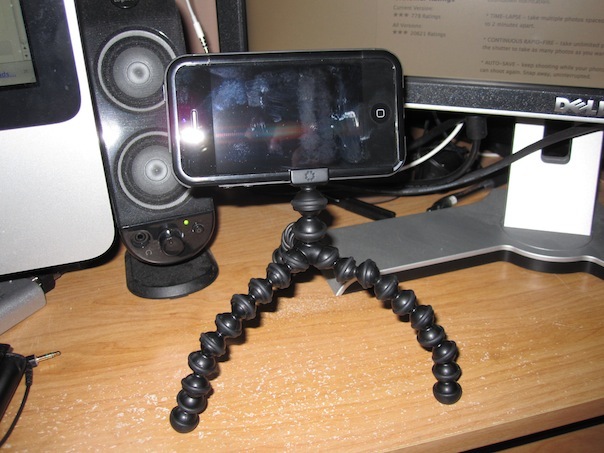 If you’re looking for a tripod solution for your iPhone 4, the Gorillamobile is a solid choice, especially if you’re primarily interested in FaceTime and desktop video blogging. If you’re more interested in taking serious photos or filming and you already have a great tripod, I’d recommend waiting to see how the Glif turns out. One should be in the mail soon, so we’ll report back and let you know how the two products stack up. Disclosure: The Joby Gorillamobile for iPhone 4 tested was provided by the manufacturer for review purposes. Hi – I’ve ordered the glif as a gift for osmeone with the iphone 4, but also want to get a gorrila joby to go with it. I looked on amazon and I don’t know which model I should purchase to go with the glif – can you help me out? If you have a screen protector (like Gelascreen from Gelaskins.com), you may have problem fitting the case from Gorillamobile for iPhone 4 without causing the edges of the screen protector to lift up.